I have a full-time job that pays our family well. The W2 income that we earn from that job pays for things like our monthly mortgage, food, utilities, cell phone bills, car payments, etc. Basically it is a good paying job that covers our monthly expenses with a little bit of savings leftover that is invested. And while this job is helping our family take one step closer every month towards financial independence … I often feel there must be a more optimized path. We have cut services like cable out of our monthly budget in order to save money. We recently started travel hacking so we don’t have to pay for family vacations. We are even paying extra each month on one of our car payments to eliminate that debt. All of these little actions will eventually add up. But what if we could do even better? What if we could grow our income even more and use those funds to invest? That is our family’s goal in 2018 … to build a side income stream that can eventually match our W2 income. There are several ideas for side hustles that come to mind, but I feel that earning blogging income may be the best option for now. There are plenty of negatives when it comes to earning income from a blog … but I feel the positives are worth the effort. So at this point, we have two main blogs … one of which is this site The Money Sprout. This is where we discuss things like investing in dividend stocks, living well below our means, building side hustles, and reaching financial independence. Our other main blog is in the health and fitness niche. We set a goal earlier this year to build up this site so that it could eventually produce side income for us. I have two big passions when it comes to blogging – personal finance and health and fitness. I cover the personal finance topics here on The Money Sprout. Every once in a while I will cover a topic on health and wellness when it relates to money here. But for the most part … I try and focus on personal finance topics. When it comes to writing about health and fitness … I try and do most of that on a separate blog that I started about 3 years ago. For the first couple of years, I never gave the health and fitness blog much love … only posting every couple of months. I didn’t have any plan or purpose for the site and treated it more like a hobby. However, now my focus has changed from blogging as a hobby to blogging as a source of side income. Since launching that site … visitors to the health and fitness blog have been limited and there have been no earnings. Instead of earning any income, the site has actually had several expenses including – domain name, hosting, and WordPress theme costs. So overall, my heath and fitness site has been cash flow negative since it first started. The good news is that we set a goal last year to earn $5,000 per month in sustainable income by June 2018 from this niche site. 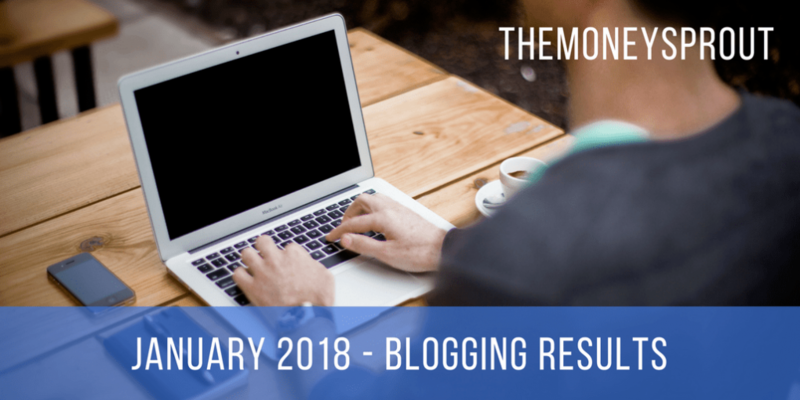 So in order to stay on track, I have been providing monthly updates on our progress … so here are the updates from January (2018). At the beginning of every month, I share a few statistics from the past 30+ days … including the social media accounts tied to this site. The plan is to increase these stats month by month … and then next year I can look back and see how much my site has grown. The good news is we have averaged over 30,000 pageviews for the past 3 months. The bad news, is that we started January off with tons of traffic and watched it quickly trend down. Our traffic from Pinterest is declining steadily … so I really need to focus on writing new content and creating more pins. We still have a goal to drive 100,000+ pageviews per month to the site by this June. If (when) that happens, it should open up a lot of potential income streams to the site so that we can work towards earning $5,000 of side income per month. Almost all of the pageviews in the past 3 months have come from Pinterest. And just to compare, prior to November we had 4,192 pageviews in October and only 1,914 in September. The growth in November, December, and January is all related to Pinterest. And while I don’t want to ignore other social media accounts … we want to focus the majority of our time on mastering Pinterest as that gives us the biggest return. 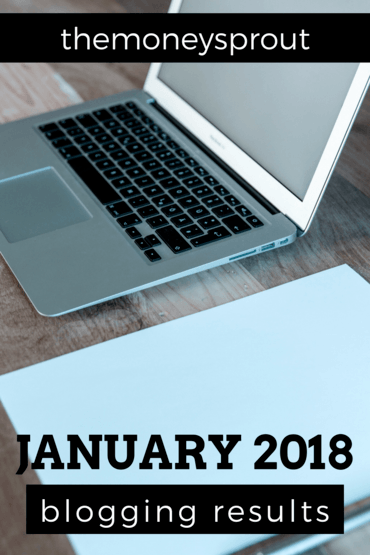 Blogging Income Results for January – How did we do? Unfortunately, I hardly did anything on the site once again. All of my time seems to be focused on publishing content on The Money Sprout. That is good and bad. Good for this site but it is also not helping grow my health and fitness niche site. I have no plans on putting in less work here on The Money Sprout … so I will need to find time in my day somewhere else. I won’t complain about not having enough time either. Despite always feeling busy … there are plenty of wasted hours in my day checking social media and watching television. I just need to convince myself to give some of that up. Since I didn’t spend anytime writing content for the health and fitness site, I missed out on one of my goals … publish 4 new posts of 1,000 words or more. Every month I keep saying I am going to write new content and it never seems to happen. It all comes down to setting priorities and just getting it done … no more excuses. I did hit one of my other goals however, which was scheduling 20 to 25 pins on Tailwind each day. I have gotten into a good routine of that. Only problem is 99% of the pins were to other websites … not my own. I certainly want to have a good mix of pins from other sites … but it won’t help with getting more traffic if I don’t pin content from my site. For the last goal in January, I wanted to hit 40,000+ pageviews for the month. We did manage to hit 30K again, but were a bit off from 40K. My long term goal is to earn $5,000 per month in sustainable income by June 2018 from this site. In reality, that probably won’t happen unless I really start to focus my time creating new content. In past blogging updates, I would set goals for the upcoming month. But since I haven’t been doing a good job hitting any of those monthly goals, I won’t post any in February. I think they tend to stress me out more than anything. Especially when I don’t hit them … it just makes me less motivated so I am trying something new. The good news is that I know there is the potential to earn significant side income from blogging. And I feel like if I can just get into a rhythm and start writing (like I am now on The Money Sprout) I can gain some momentum. For the past 3 months, the health and fitness blog has averaged well over 30,000 pageviews per month and I haven’t written a single new post. That is very encouraging to me that I am getting visitors without doing anything. It shows me there is a lot of potential to build a sustainable income stream from blogging and in particular this health and fitness site. Okay … enough of that … it is time to get writing!